Researchers have successfully protected foals against a potentially life-threatening infection by innoculating their mothers in the weeks before birth. Rhodococcus equi is one of the most important causes of illness in foals between one and six months of age, particularly if they don’t have much resistance. It is behind a lethal form of pneumonia. By the time symptoms of panting and coughing first appear, the only course of action is the expensive and time-consuming use of antibiotics. Colette Cywes-Bentley and Joana Rocha led a study in which researchers devised and tested an experimental system relying solely on antibody-mediated protection against R. Equi. Immunity was induced by vaccinating a dozen pregnant mares with a candidate vaccine six and three weeks before they were scheduled to give birth. This provoked an antibody response in the mares. The vaccine targeted the conserved surface antigen found on many microbes, termed PNAG. The study team, writing in the open-access journal PLOS Pathogens, confirmed that the antibody had been transferred to the foals via colostrum immediately after birth – the only way for foals to acquire maternal antibodies because horses lack antibody transfer via the placenta. 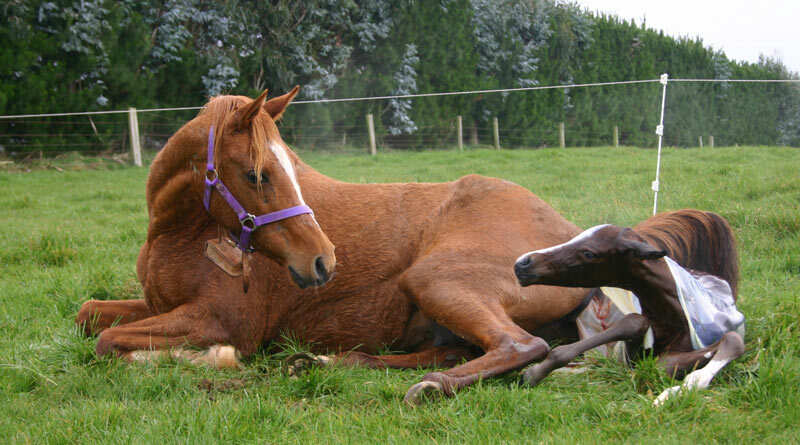 Seven foals born to unvaccinated mares were used as controls. The foals were exposed at about four weeks of age to live, virulent R. equi via the lungs in a randomized, controlled, blinded challenge. Eleven of the 12 foals born to immune mares (91%) did not develop clinical R. equi pneumonia, whereas six of the seven foals (86%) born to unvaccinated controls developed pneumonia. It was found that some of the vaccinated foals developed small subclinical lung lesions, indicating that the viral challenge had resulted in some uptake of R. equi. However, they resolved rapidly without development of detectable clinical signs of disease. In a confirmatory passive immunization study, infusion of horse plasma containing the antibody protected five foals against R. equi pneumonia, whereas all four recipients of normal horse plasma developed clinical disease. All foals infected in the study successfully recovered. The study team acknowledged that development of effective vaccines for intracellular pathogens, such as R. Equi and those that cause diseases such as tuberculosis and brucellosis, has proved challenging. The findings, they said, supported the development of PNAG as a vaccine for these kinds of bacterial pathogens. The protection studies for R. equi in foals led to the implementation of a human trial evaluating the effect of an infusion against tuberculosis. Discussing their findings, the researches said: “The success of immunization in protecting against R. equi challenge in foals targeting the broadly synthesized PNAG antigen raises the possibility that this single vaccine could engender protection against many microbial pathogens. “While the potential to protect against multiple microbial targets is encouraging, the findings do raise issues as to whether antibody to PNAG will be protective against many microbes or potentially manifest some toxicities or unanticipated enhancements of infection caused by some organisms. The full study team, from a range of institutions and organisations, comprised Colette Cywes-Bentley, Joana Rocha, Angela Bordin, Mariana Vinacur, Safia Rehman, Tanweer Zaidi, Mark Meyer, Sarah Anthony, McKenzie Lambert, Daniel Vlock, Steeve Giguère, Noah Cohen and Gerald Pier.